Prominent blogger Mike Acebedo Lopez exposed the real identity of the husban of the viral "5-Minute Girl," Prosecution Attorney Mark Roland Estepa is the proscution lawyer of the Aquino administration who handled the obviously trumped-up election sabotage case against former Pres. Gloria Macapagal Arroyo and the tax case against the late CJ Renato Corona. According to Lopez, it seems like the prosecution lawyer Mark Roland Estepa seems liklely to be Noynoy Aquino and Leila De Lima's henchman. If so, Lopez admitted that he no longer surprised why they are in the middle of this firestorm of controversy. Mike Lopez also noted that nearly every single person who has persecuted both PGMA and CJ Corona has had their comeuppance. 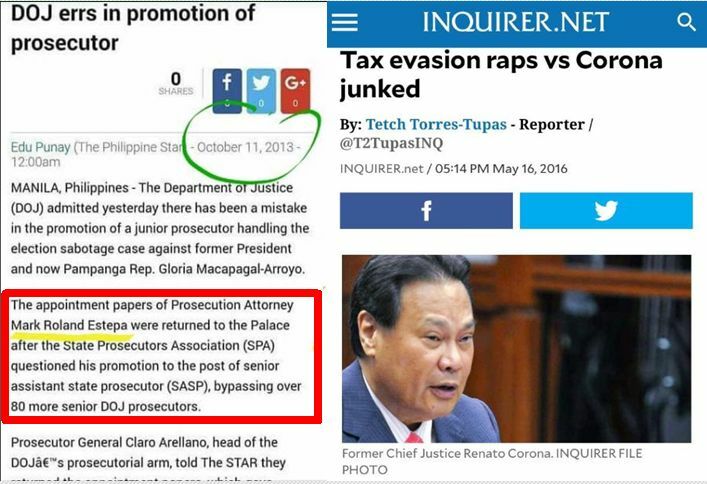 Mark Roland Estepa made national news headline in October 2013, when the Department of Justice admitted that there has been a mistake in his promotion from a junior prosecutor handling the case against Arroyo and his appointment to become a senior assistant state prosector, bypassing over 80 more senior DOJ prosecutors. So the husband of 5-minute girl in that viral video of the two of them in a tussle with the MMDA, in what was such a grand display of entitlement, was the prosecutor who handled the obviously trumped-up election sabotage case against former President and incumbent Speaker Gloria Arroyo and the tax case against the late Chief Justice Renato Corona? Seems like he was Noynoy Aquino and Lelia De Lima’s henchman. If so, I am no longer surprised why they are in the middle of this firestorm of controversy. Nearly every single person who has persecuted both PGMA and CJ Corona has had their comeuppance. Halos tanan nga nanamas-tamas ni GMA kay gi-abtan gayud ug saktong gaba. Kini ay tataw ug tin-aw, ug dili na malalis. Ang gaba, paabuta lang, kay mu-abot ra na. Makurat niya ka. Do your very worst against others, say the very worst against them, but just be ready... Karma always comes to collect. Always.